Why: To give thanks and praise to our Lord and Savior. When: In celebration of, or in thanksgiving for: the deceased, birthdays, births, weddings, anniversaries, graduations, special occasions, loved ones, etc. Where: St. Paul’s Altars (chapel too) each Sunday. After Sunday services, flowers are delivered to those we want to reach out to, and especially remember. What: Temporary (one time) or permanent (every year) arrangements are available with a suggested contribution of $35. How: Contact Sue Vines, 412-343-5752 [email protected], or leave a message in the Altar Guild mail box. Spread Christmas joy to special St. Paul’s parishioners by delivering poinsettias from our Altar decorations. Plants will be available after the 10 AM service on Christmas Day or in the days following. Addressed gift cards with addresses may be picked up in the Undercroft. Make a family outing of outreach a part of your Christmas traditions and bring a smile to someone in your church family. The Christmas Services at St. Paul’s are glorious as we worship in celebration of the Birth of Our Lord Jesus Christ. The Altar Guild will decorate the church for these services with poinsettias, greens, and candles. It is our custom that these decorations are given in memory of loved ones as well as a meaningful thanksgiving for the blessings in our lives. The names of those remembered and honored, and the donors, will be printed in the Christmas bulletin. A contribution of $15 for each name is requested. Remembrances may be submitted online at https://stpaulspgh.formstack.com/forms/christmasfl...or by paper form, which will be available in the office and in the Sunday bulletin. You can also download a PDF of the form here. 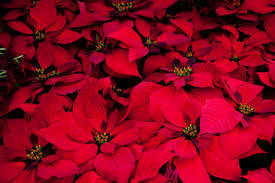 The poinsettia plants will be delivered to those we want to reach out to and especially remember at this time of the year. The delivery cards and plants may be picked up after the 10:00 am service on Monday, December 25.